COCARD has been notified that pcAmerica’s Cash Register Express/Restaurant Pro Express customers must upgrade to version 12.8033 as soon as possible. If your point of sale is not on version 12.8033 or higher, please contact your COCARD representative to avoid any payment processing interruptions. Transport Layer Security (TLS) is a protocol that provides privacy and data integrity between two communicating applications. It’s the most widely deployed security protocol used today, and is used for Web browsers and other applications that require data to be securely exchanged over a network. Several payment processors, including First Data/TSYS, are phasing out TLS 1.0 and TLS 1.1 by the end of February 2018 with only TLS 1.2 being supported. All PC America users processing with First Data / TSYS who do not have the updated version of PC America’s Cash Register Express 12.8033 will no longer be able to process credit cards through their point of sale system as of 2/28/2018. To ensure your system is compatible with this change, you must be using the latest version of Cash Register Express. 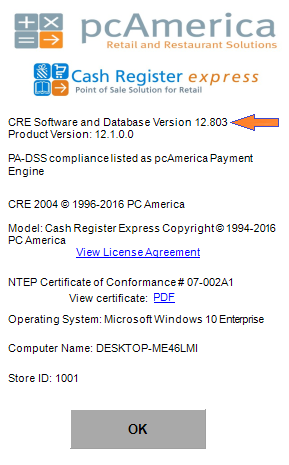 Upgrade Your CRE/RPE Software to Version 12.8033 by calling 1-800-317-1819 Ext. 4360 or email support@cocard.info. Please use the contact form provided below and one of our support team will give you a call ASAP!